Persistence Market Research offers 10-year forecast of the U.K. and Germany bed bugs control services market between 2016 and 2026. The primary objective of the report is to offer insights on the advancements in the U.K. and Germany bed bugs control services market. The study demonstrates market dynamics that are expected to influence the current environment and future status of the U.K. and Germany bed bugs control services market over the forecast period. This report is to offer updates on trends, drivers, restraints, value forecasts, and opportunities for manufacturers operating in the U.K. and Germany bed bugs control services market. To understand and assess market opportunities and trends, the U.K. and Germany bed bugs control services market report is categorically split into two sections based on market segmentation – by services types and by end-use industry. The report starts with the market overview and provides a market definition and analysis about region-wise (U.K. and Germany) value chain and pricing, drivers, restraints, and opportunities in the U.K. and Germany bed bugs control services market. The sections that follow include an analysis of the U. K and Germany bed bugs control services market – by service type and end-use industry. All the above sections evaluate the market on the basis of various factors affecting the market. Each section discusses the qualitative and quantitative aspects of the U. K and Germany bed bugs control services market. To give a brief idea about revenue opportunities for the service types and end-use industry segments, the report also provides volume (KT) data, absolute dollar opportunity, and total incremental opportunity for each segment over the forecast period (2016-2026). A section of the report discusses how the overall competition in the market is steadily increasing and discusses various factors that are shaping internal as well as external competition in the market. Overall internal competition in the U. K and Germany bed bugs control services market is comparatively high. In the final section of the report, a competitive landscape has been included to provide report audiences with a dashboard view. Detailed profiles of service providers are also included in the report to evaluate their long-term and short-term strategies, key offerings and recent developments in the U. K and Germany bed bugs control services market. Key market competitors covered in the report include Ecolab, Inc., Rollins, Inc., Rentokil Initial Plc., Service Master Global Holdings, Inc. (Terminix), Massey Services Inc., Pelsis Ltd., and Killgerm Ltd. This study discusses key drivers and trends contributing to the growth of the U. K and Germany bed bugs control services market, as well as analyses the degree to which drivers are influencing the market across the countries assessed in this report. In addition, it is imperative to note that in an ever-fluctuating Europe economy, we not only conduct forecasts in terms of CAGR, but also analyze the market on the basis of key parameters such as year-on-year (Y-o-Y) growth to understand the predictability of the market and to identify the right opportunities. Also, another key feature of this report is the analysis of all key segments in terms of absolute dollar opportunity. This is traditionally overlooked while forecasting the market. However, absolute dollar opportunity is critical in assessing the level of opportunity that a provider can look to achieve, as well as to identify potential resources from a sales and delivery perspective in the U. K and Germany bed bugs control services market. During the detailed research on the U. K and Germany bed bugs control services market report, we observed that insects are becoming prone to chemical-based products and therefore pest control products are not able to work effectively in destroying them. To overcome this problem, manufacturers have started increasing the percentage of chemicals in various pest control products, which has been adversely impacting the health of humans. As a result, the government has implemented stringent regulations in various countries ensuring that these chemical-based products meet the prescribed levels of chemicals in pest control products. This particular factor is likely to hamper the growth of the overall pest control services and products market during the forecast period. Will a growing consumer awareness increase the sale of bed bugs control services in U.K. and Germany? In terms of value, the U.K bed bugs control services market is anticipated to expand at a CAGR of 4.7% during the forecast period (2016 – 2026) and is expected to be valued more than US$ 12 Mn by 2026 end. The Germany bed bugs control services market is estimated to register a CAGR of 5.2% during the forecast period and is anticipated to hold a market valuation of more than US$ 16 Mn by the end of 2026. 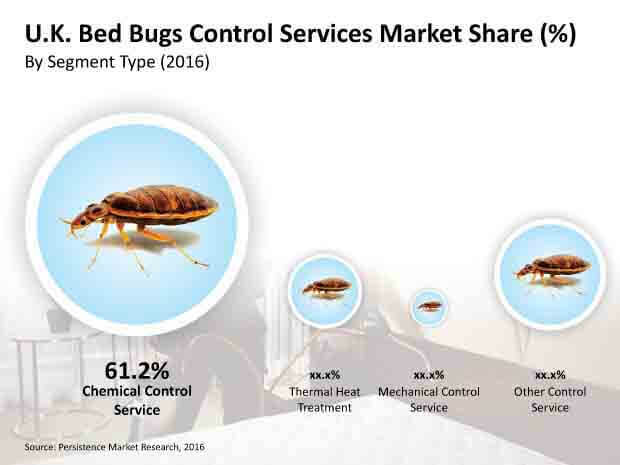 Among all bed bugs control services types segments in the U. K and Germany bed bugs control services market, chemical control services is projected to be the fastest growing segment over the forecast period (2016–2026). This segment accounts for approximately more than 60% of the sales of the U.K. bed bugs control services in 2015; attributed to growing consumer awareness concerning health and hygiene along with conducive weather conditions for propagation of bed bugs and growing number of international and domestic travelers across Germany and the U.K. Growing prevalence of vector-borne diseases and infections resulting from common household pests is increasingly encouraging end users to increase their spending on pest control services. Furthermore, increasing adoption of central heating systems and installation of glazing systems across residential and commercial sectors in order to insulate rooms during the winter season are factors expected to further fuel bed bugs infestations and in turn drive demand for bed bugs control services. Growth of the bed bugs control services market in the U.K. and Germany is specifically driven by the increasing number of international tourist arrivals, increasing occurrence of domestic trips and houses with multiple occupancy. Other factors such as favorable weather conditions in these countries along with increasing adoption of central heating systems and installation of glazing systems across residential and commercial sectors in order to insulate rooms during the winter season are factors expected to further fuel bed bugs infestations and in turn drive demand for bed bugs control services. Some of the major restraints impacting revenue growth of the U.K. and Germany bed bugs control services market is the increasing concerns due to the toxicity levels in pesticides and the health issues that are associated with the use of toxic pesticides in pest control. Also, implementation of stringent government regulations to limit levels of chemical toxicity and restrict use of highly toxic pesticides in order to reduce hazardous impact of the same on public health and environment are hindering the widespread adoption of bed bugs control services to a certain extent. In Germany, the chemical control services segment accounted for majority market share in 2015. Revenue contribution of this segment to the Germany bed bugs control services market is expected to increase at a CAGR of more than 5% from 2016 to 2026. Increasing adoption of bed bugs control services across hotels is a major cause for increasing demand for bed bugs control services in the U.K. and Germany. Some of the major players in the bed bugs control services market in the U.K. and Germany market that are covered in this report are Ecolab, Inc., Rollins, Inc., Rentokil Initial Plc., Service Master Global Holdings, Inc. (Terminix), Massey Services Inc., Pelsis Ltd., and Killgerm Ltd. The report also describes company-specific strategies related to key developments and market consolidation initiatives.